VON ORM – Did you know that Mariachi is now a recognized UIL Event? The inaugural UIL State Mariachi Festival will be held this weekend, beginning at 5 p.m. on Fri., March 11 and continuing through Sat., March 12 at 10 p.m. at Southwest High School. Southwest High School’s Mariachi Los Dragones takes the competition stage on Sat., March 12 at 5:15 p.m. Mariachi groups that are competing at the State level have advanced through various rounds of competition all held within the last few weeks to get to this moment. During those stages of competition, the judges were looking for tone intonation, instrumental technique, interpretation and showmanship in the groups that they selected to advance. “It is a privilege and honor to be hosting this event at SWISD not only because we have always been very supportive of incorporating the mariachi program at our campuses, but also because we are happy to see that Mariachi music is finally a recognized part of the Texas education system,” said Dr. Lloyd Verstuyft, Superintendent of SWISD. 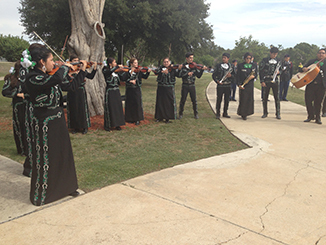 Mariachi Los Dragones has hosted the MASBA State competition for the past two years, and hosting the UIL Competition is a task that the District has been preparing for several months. These are really popular places in the city for private events for corporations like us. It can be hard to find the right venue for big events. The right size event space San Francisco, that is flexible fits well. Thanks to you.